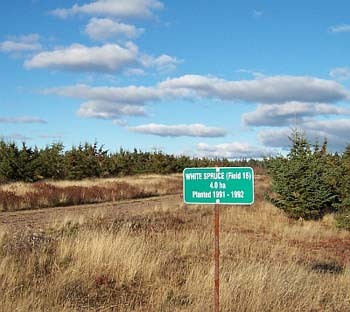 The Forest Renewal/Reforestation Section is responsible for the Strathlorne Forest Nursery located just outside Inverness, Cape Breton and the Tree Breeding Centre property located in Debert, twenty kilometres west of Truro. This section also operates two seed orchards in the Annapolis Valley and stores seed for both nursery production, research activities, gene conservation and special interest collections. Produce forest tree seedlings at the Provincial Forest Nursery for use in reforestation programs using improved orchard seed. The Department of Natural Resources has operated a nursery in Nova Scotia since 1949. Produce forest tree seed, from eight seed orchards, for seedling production at the Strathlorne Forest Nursery. Excess seed is available at established prices to private nursery operations. Provide information regarding reforestation planting stock and genetic sources to forest owners, managers, and the public. Provide technical tree breeding advice, data analysis, and record maintenance for the Nova Scotia Tree Improvement Working Group (NSTIWG), an industrial-government cooperative program established in 1978. Provide technical advice regarding conifer tree reproductive physiology and cone crop development.